Taking an unpaid internship can cost an individual £926 a month in London or £804 in Manchester, suggests research for an education charity. The Sutton Trust says the cost of working for nothing rules out all but the wealthy and wants most interns to be paid at least minimum wage. A third (31%) of graduate interns are unpaid, according to the charity's analysis of official data. 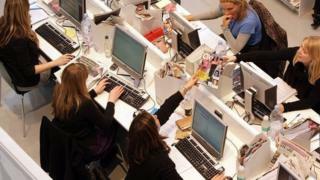 The CBI warned that banning unpaid internships could reduce opportunities. The report uses government figures to suggest that some 22,000 interns may be working for nothing. It analyses the costs of living in London and Manchester for interns on sixth-month work placements. Taking into account rental for a room in a shared property, household bills, council tax, food and miscellaneous spending on items such as broadband, cleaning products and clothing, a Londoner would pay, £5,556 for the period and a Mancunian £4,827, amounting to £926 and £804 each month. The researchers excluded transport costs as these are often paid by interns' employers. "Internships commonly represent a first step in the ladder towards a professional career in the most competitive sectors, including fashion, journalism, politics, law, finance and the charity sector. "Because these areas are so competitive, employers are often able to offer internships as completely unpaid positions," says the report. "These issues make unpaid internships a serious and pressing problem for social mobility." The trust says all interns on placements of over a month should be paid at least the national minimum wage of £6.50 an hour, and preferably the national living wage of £7.85 - or £9.15 in London. It wants internships to be advertised publicly, rather than being filled informally and recruitment processes to be fair, transparent and based on merit. Dr Lee Elliot Major, the trust's director of development and policy, said taking an unpaid internship was "beyond the means of the vast majority of individuals". "Paying all interns who work for over a month the minimum wage would significantly improve access to these placements for those from more modest backgrounds, offering them a stepping stone into many coveted jobs, thus increasing social mobility." An Ipsos Mori poll of 1,700 adults in England for the charity suggested 70% felt unpaid internships were unfair as only the wealthy could afford to take them. Some 55% agreed internships of up to six months should pay at least minimum wage, with 73% supporting it for placements of over a year. Katja Hall, deputy director of the CBI, said: "The law is clear. Someone doing a job should be paid, but it's important to distinguish between that and informal workplace experience or work shadowing. "Banning unpaid internships would only reduce the number of opportunities available." Ms Hall said internships boosted young people's chances of permanent employment and businesses should be encouraged to offer them. A spokeswoman for the Department of Business, Innovation and Skills said getting a job for the first time could be "daunting" for any young person. "Internships can provide an important first step and are often a valuable way of helping young people start work. They should be open to everyone in a fair and transparent way. "Anyone who is a worker is entitled to be paid at least the minimum wage, this includes interns who fall into the worker category. "The government is cracking down on employers who break the law by not paying the minimum wage - we are naming and shaming offenders and increasing penalties." The spokeswoman urged anyone who felt exploited to contact the Pay and Work Rights Helpline on 0800 917 2368. Stephen Isherwood, chief executive of the Association of Graduate Recruiters, said the majority of its members paid their interns. "We don't agree with long-term unpaid internships as a general rule; they aren't good for social mobility as they exclude people who can't afford to work unpaid. Talented graduates expect to be paid for their work."